A question I often get from readers is, "I'm 25 and I've just started addressing my social issues. I feel so far behind everyone, and that's not even including the time it will take to get up to speed. Is it too late for me? Will I ever be able to have a fun, normal social life?" You could substitute that '25' for any other age, though most often the question comes from people in their mid-twenties. I've gotten it from readers who are as young as 15, and as old as their fifties. That's just of the people who wrote me about that particular topic. This site has its share of readers who are 65 and older. The answer is, "No, it's not too late for you. Not even close." I understand where this worry comes from though. When you're a late bloomer it's easy to believe you've missed your chance to do certain things and that the world has passed you by. You can feel like you have to get over your issues now, now, now or your life will be over. The reality is you have way more time than you think. The core fear of people who are behind is that they've missed the window to create the kind of social life they want. You don't need to worry. Pretty much anything you could do at 20 you can still do when you're older. Late bloomers of any age can worry they won't get a chance to make friends. It does get harder to meet people and put together a social life when you're out of school. Everyone's busier and you're not constantly surrounded by hundreds or thousands of peers. However, just because your friend-making circumstances aren't at their peak of easiness doesn't mean they're a lost cause. At any age there are going to be people in your area who are open to forming new friendships. Not everyone has had the same social circle for years and years and isn't interested in meeting anyone else. If you go on sites like Meetup.com you'll see people have created groups catering to all ages. Also, plenty of people have shy or awkward tendencies in every age range. However old you are, it's not as if everyone in the world has flawless social skills except for you. When you're out there trying to practice and make friends no one's going to look at you and think, "Whaaaaat?! Someone who's awkward at this age?! How is that ever possible? Did they escape from somewhere?" You'll just be another shy person, of the kind they've come across a million times before. And usually if you have other good qualities to offer them, they won't really care about your awkward side. Whether they're 19 or 42, someone who are hasn't done much dating can fear that they're too old or unappealingly inexperienced to ever get into a relationship. 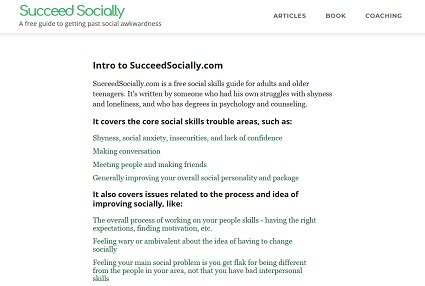 This site doesn't focus on the dating aspect of social skills, but I'll say something about this quickly. There are plenty of cases of people in their 30's and older who had never been in a relationship, and then addressed their issues and found one later in life. I'm not saying for a second it there weren't more obstacles in their way than if they'd been dating since middle school, but it can be done. Late bloomers in their mid-twenties sometimes worry that since they "wasted" their college years they've missed their chance to party and do all the crazy things university students do. The fact is people still hang out, have fun together, and party after university. If you're so inclined, most of the things you could do in college you can still do at 28 or 33. Sometimes you're even able to party harder and more easily. Instead of scrounging up money to buy some cheap pre-gaming beer and then going to a student dive bar, you could use your independence and disposable income to go to Vegas or Montreal or wherever with your friends for the weekend . It's probably fair to say middle-aged people as a whole care less about partying it up, but if they want to they can still do it as well. Go to any larger or mid-sized city and you'll find bars and lounges that cater to an older crowd. Part of it can be chalked up to remnants of the teenaged worldview that all adults are lame, just like parents and teachers. Adults often don't show their wilder side to younger people, and come across as more buttoned up than they are. And of course most people do ease back on the partying as they get older. They've got it out of their system and have other priorities. They may stop entirely, or do it much more rarely. However, not every 'adult' is like that. If anything, because people are taking longer and longer to settle down in Western cultures, there are more of these types of adults around than ever. The point is, if you're 29, fresh out of your shell, and still want to go out with a bunch of friends and hit the bars nearly every weekend, there are plenty of like-minded people who will do that with you. Maybe not as many as when you were 19, but enough. 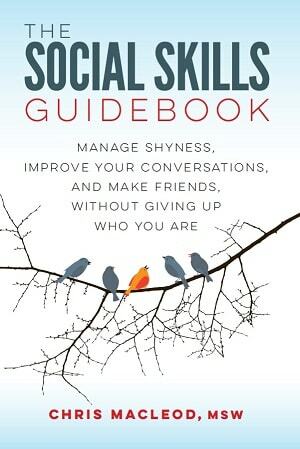 There's no critical window for learning social skills. Like with any skill there are benefits to getting an early start, but you're not locked out if you start working on them later in life. You can catch up to everyone else too because people's social savvy starts to level off at a certain point. So while many people are slowly improving at their higher proficiency and refining the groundwork they've already laid, you'll quickly move up the more basic and intermediate ranks. Before long you'll be on fairly equal footing. Especially in Western cultures, there's a belief that once people hit middle-age they start getting more and more feeble and useless and stuck in their ways. The idea is so pervasive that many older adults believe it themselves, and don't attempt to learn new things or give up on them too easily. Being younger does give you an edge in learning certain skills, like how languages come more easily to children. However, some people exaggerate those advantages and see learning as an adult as more difficult than it is. People can forget how long it actually took them to learn new things when they were younger. They may have memories of always being decent at the piano, but don't recall it actually took them a few years of lessons before they got the hang of it . Society often talks of learning new skills in terms of what it will take to become famous and world class in them. If you want to become a champion skier or rock star you do need to start young. However, people can take that as saying, "Once you're older you can't learn new things at all." The upper-upper echelons may be out of reach, but if they're motivated to learn and put in enough practice someone can still become highly proficient at new skills when they're older. Not only are the learning abilities of the young over-hyped, but adults have their own strengths when it comes to learning new skills. Their mental abilities are fully formed. They have increased levels of discipline, study-skills, and knowledge, as well as their previous experience with mastering other abilities. "High school/college are the best years of your life"
That idea plays a big role in many people's concerns that it's too late for them once they're out of their early twenties. Can high school and college be really fun and full of good friends and fond memories? Absolutely, for some people those years are the highlight of their lives. But it's ridiculous to make a blanket statement that if you didn't get much out of your school days then you missed out on some magic you'll never get back. The best years of your life can come at any age. To give one easy example, imagine someone who was shy and lonely through high school and college, and then spent their mid-thirties traveling around the world, getting into awesome adventures, meeting lifelong friends, and having exciting romances. Could you really argue that as rewarding as that globe hopping may be, it still wouldn't stack up to going to a bunch of samey frat parties at a second-tier college in some middle-of-nowhere town? Looking back, I think that when you're younger you're unconsciously trained to see life in four-year chunks. High school takes four years and you end up thinking that if you don't hit certain social milestones by the end of that time then you've failed. Then, if you go to college, that's another four-ish years. If you don't reach those same goals by the point you have your degree then you believe you're really a failure. Even after college, you can mark being 25 or 26 as another waypoint, and then 30. But really, saying you should have done X by the end of university or your 'loser rating' goes up further is somewhat arbitrary. Is there really that much difference between being a 21-year old student and a 22-year old graduate? Another thing is that when you're younger you only have a hazy idea of the future, so you feel this faint urgency to have certain experiences right away before you 'run out of time'. But nothing happens when you hit whatever age it is you're dreading. Life keeps going for decades and decades more. At any point you can devote a few years to catching up socially, after which you can enjoy the remaining time like anyone else can. Say you never start really hanging out with a solid group of friends until you're 22. You still have eight more years of being young to have fun and play make up for lost time before you turn 30. Eight years is double the length of high school or college. And that's assuming life suddenly dries up at 30, an idea I've already mentioned isn't the slightest bit true.